We’ll be at MCM London, sharing with Turnaround on stand N610 for the first time along with Dave Cook (Killtopia), Gary Chudleigh (Plagued) and a very special guest. We’ll be at Shrewsbury for the first time along with Frank Quitley (All star superman, Drawings + Sketches), Sha Nazir (BHP Publisher) and Nicola Love (Glasgow Comic Con). Come say hi. it’s our very own Glasgow Comic Con, the one the set off BHP down this path, now up for it’s 9th year! Time flies, pop along and see a whole host of BHP creators and a plethora of International and UK guests. Fife’s largest and biggest comic con returns. BHP will be exhibiting there Sat 30 March, with some special books popping up. BHP will be exhibiting and meeting other publishing business’s at London Book Fair, we’ll be at the shared Publishing Scotland stand 2C80. To book appointments please email Sha direct. One of Edinburghs biggest geek events, all for charity. BHP will be exhibiting there, with a special guest signing by Frank Quitely on Sat 16 Feb and Tanya Roberts will also be exhibiting all weekend. SYP Scotland are back in 2019 with our new conference: Building Bridges, Breaking Walls! Join us on Friday 15th February at Central Hall in Edinburgh. Sha Nazir will be representing BHP on one of the panels. The fourth annual SYP conference in Scotland will focus squarely on two themes, Building Bridges covering the work being done to connect the literary world, establish new audiences and reach out internationally, and Breaking Walls which will cover the industry’s drive to become more inclusive, the promotion of good mental health within the industry and the growing presence of both Indie start-ups and anthology publishing in Scotland. Ticket tiers: SYP Member (£30), Non-member (£35). Our Summer Sale is on now! 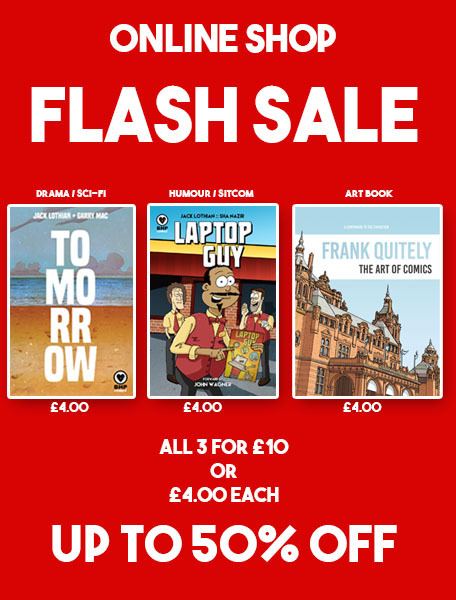 Get some of our best-loved comics for just £4 each or £10 for all three! The Full Colour mentoring programme is now in full swing. We are currently offering a drop-in crash course on making comics to young (14 - 26 year old) people from a black, asian and minority ethnic background. We are working with creative professionals in the industry who will be offering advice to budding comics talent. If you plan on attending any of these workshops, please email Nyla@bhpcomics.com to reserve a space. Our feedback showed Glasgow and Edinburgh to be the hubs for our participants, however, we can make arrangements with any Dundee (or further afield) participants so they do not miss out. Please email Nyla@bhpcomics.com to let us know you'd like to join in. There is no obligation to attend every workshop so feel free to drop in to the sessions that work around your schedule. If you plan on attending any sessions please email nyla@bhpcomics.com to reserve a space. 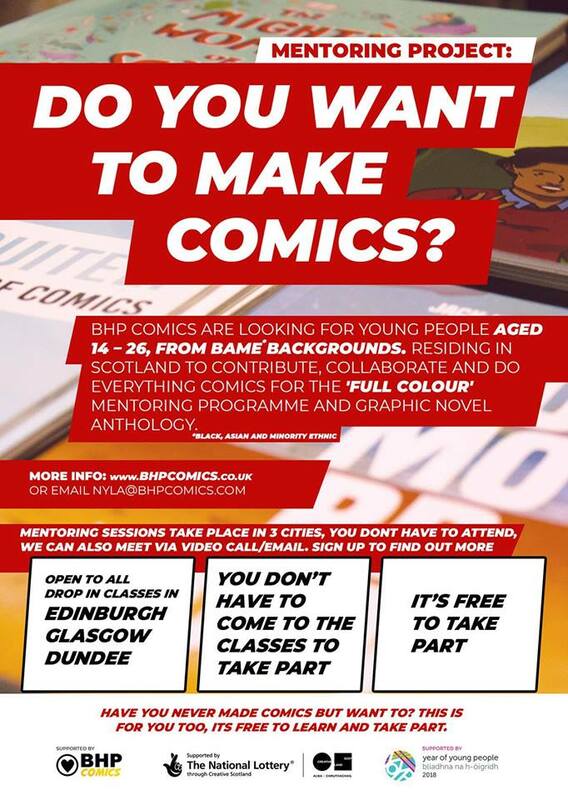 Find our more about BHP's Full Colour project, a mentoring programme designed to help creators from BAME backgrounds get started in comics, at this meet-up with the project creators! Full Colour is a year long mentoring and development programme that will support and amplify the voices of comics writers and artists from BAME backgrounds living in Scotland, culminating in the publication of a graphic anthology of their work to launch at Glasgow Comic Con 2018. BHP will mentor the creators through a selection of workshops and face to face meetings with a focus on creative practice, editorial work, networking and career development at a national and local level. The young people involved in the project will contribute and collaborate to make the aforementioned graphic anthology as well as work towards producing their own work, leading to those involved forming a portfolio for future development. The publication and programme will be the first of its kind in the UK. By encouraging this group to make comics and develop a creative practice we hope to change the landscape of comics in the future, making it a far more inclusive and welcoming industry. ECAF, Edinburgh Comic Art Festival, aims to be a hub for comics over the last weekend of Book Week Scotland, story telling is important in Scotland and even more so in the capital. ECAF is a great first time event for anyone new to comic books and a familiar setting if you’re an old hand. If you love art, love reading and love stories, then this is the prefect event for you whether you’re 9 or 90. ECAF is a uniquely vibrant and inspiring gathering of artists, comic authors, fans and readers. Help us maintain Edinburgh’s reputation as the world’s leading literary City by showing your support attending the event and buying a new book to read. Learn how to survive and thrive in the comics industry with hot tips from Gary Chudleigh (Plagued) and Alan Grant (Rok of the Reds, 2000AD). Comics fan John McShane leads the discussion. This event is free to under-25's. You may be asked to show ID with your date of birth on collection of tickets, and at the event venue. Free for Under 25s, to book, visit the website. We'll be at Leeds, Thought Bubble event, in the new Marquee in the centre of town. And this year we'll have a host of creators on hand all weekend signing at the BHP stand. BHP Comics is proud to present Tomorrow, a speculative fiction graphic novel by acclaimed screenwriter Jack Lothian and artist Garry Mac. Tomorrow is a haunting sci-fi story, in a prestige format one-shot graphic novel, from screenwriter Jack Lothian (Strike Back, Doc Martin, Shameless, Skins) and artist Garry Mac (Gonzo Comic, Freak Out Squares). BHP Comics is going to London Super Comic Con 2017 for the first time ever! We will be brining along our books from comics legends like Frank Quitely, Alan Grant and John Wagner as well as up and comics creators! Find us at T52 and T53! The name Frank Quitely has become synonymous with such iconic characters as Batman, Superman and the X-Men, and Scottish comics book artist Vincent Deighan – the man behind the pen name – has become an artist of similarly titanic proportions. Collaborations with such greats as Grant Morrison and Neil Gaiman, along with contracts with the two giants of comics publishing, DC and Marvel, have marked Quitely’s path to the top of his game. An exhibition at Kelvingrove Museum and Gallery which runs until beginning of October charts this trajectory, showcasing the largest collection Quitely’s ever displayed, as well as presenting a selection of his influences and inspiration, from an original Batman comic strip to the Broons. Frank will be joining us for a really very special event to present the book published to go alongside the exhibition. We’ll be transforming the shop into a mini gallery itself for Frank to chat all things comics with writer and illustrator Sasha de Buyl-Pisco, and of course to answer any questions you yourself might bring along.